Check out our “Get Involved Guide” for more stories about local organizations. Thank you to Bosco Lounge for sponsoring this series. Want to contribute a write up of a group you care about? Message editor@oc115.com with your idea. 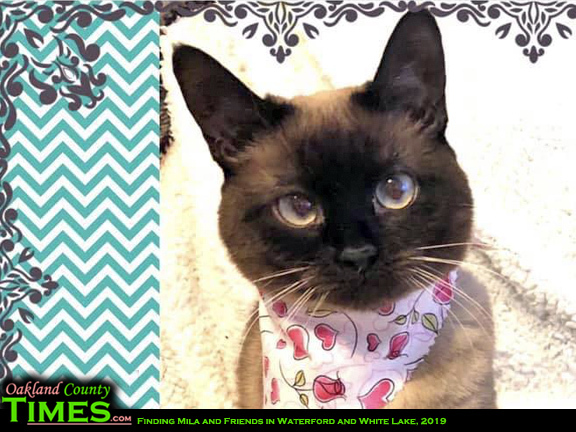 White Lake, Waterford, MI- Finding Mila and Friends in Waterford and White Lake Michigan group on Facebook began as a local community effort to help Jenny May find her missing cat, Mila. What started in the Waterford community Facebook groups centralized into the new group with members excited to help in any way they could. After seven harrowing weeks and Jenny trying every possible thing she could think of, Mila was finally home and the Finding Mila group became the place to go to for any lost pet situations. Along with sharing, the group became a significant source of support, kindness and caring for pets and their people. Almost a year later, Finding Mila is over 1000 members strong and covers Waterford, White Lake and all neighboring cities. Jenny’s kindness, generosity and pure selflessness has been contagious and as the group has grown, it has become more diverse in the ways it helps. As of now, Finding Mila is sharing, spending hours scouring through every possible lost pet page, site or app, trying to get pets home where they belong. It is members offering to go out searching, helping make posters and doing actual leg work. It’s sharing in the glories of reunited pets and sharing the heartaches of the unfortunate situations. Finding Mila has helped raise funds for injured and /or sick pets. It offers a safe place to post for re-homing pets and assistance with vetting potential new owners if needed. The group includes fosters, rescues, cat trappers who do TNR, members of The Lost Dog who actively search and help trap lost dogs, volunteers from our local animal control, and the most animal-loving people around. Finding Mila and Friends is all volunteering. Rewards or payment are never sought or needed. The best reward is the difference the group makes, the bonds created through these situations and the pure joy obtained by helping others. My name is Dawn Fashho, and along with Jenny May and our truly amazing members, we are Finding Mila and Friends in Waterford and White Lake, Michigan. We welcome all to join us and help be our eyes and ears in our communities to aid in bringing lost pets home as well as welcoming anyone who needs our help with any pet needs or situations. If you live in the area and want to help with happy reunions, join the Finding Mila and Friends Facebook Group. Thank you to Bosco Lounge at 22930 Woodward Ave, Ferndale, MI 48220 for sponsoring our “Get Involved” series featuring local nonprofits, clubs, and groups. Check out a city by city list here. Want to contribute a write up of a group you care about? Message editor@oc115.com with your idea.